AFCOM, a market leader in educating, connecting and guiding the data center community is hosting its annual Data Center World Expo in Phoenix this week. 1,800 attendees will participate in this week-long industry event, including our Align Data Center team. In today's blog, we asked our experts to share some of the 2019 trends they found interesting from this year's conference. Whether a simple re-rack & stack, to a full-blown migration from one data center to another – attendees, presenters and exhibitors have been highlighting that proper planning and project oversight is critical to minimize business impact and reduce risk in these transformation events. They also are sharing some common pitfalls to watch out for, outlining who makes up a proper “migration team,” and how to establish and maintain the most efficient migration process. From best-practices for planning and testing of back-up services to the products and services available to data center engineers, ensuring a facility can remain functioning during an incident or emergency is something that keeps everyone up at night. Attendees are hearing from DR specialists during break-out education sessions, and the exhibit hall is filled with manufacturers focused on helping maintain uptime. 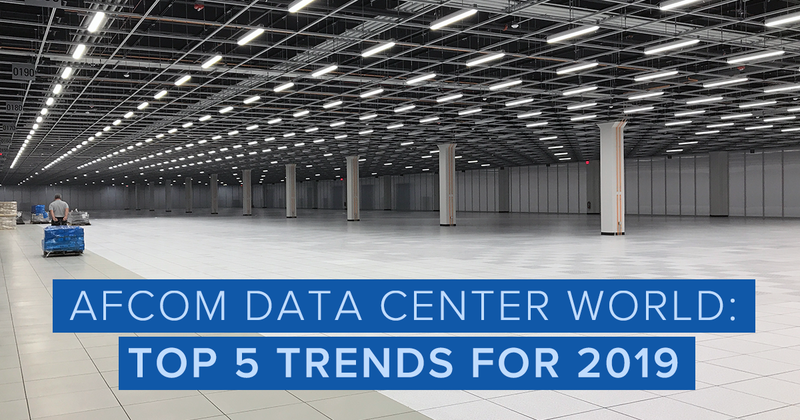 Data center hygiene is taking a bigger role in the 2019 event – with manufacturers and data center specialists reminding attendees that 75% of hardware failures in a data center are caused by dirt and dust in the environment. Planning for and maintaining strict guidelines on who & what can enter a facility – along with some advanced technologies now available to reduce dirt & dust – is educating operators on the importance of cleanliness. Data-intensive applications, including IoT and other digital transformation programs, continue to increase the need for companies’ ability to scale rapidly and remain competitive, with much unknown about the future implications to their capacity requirements. Flexible solutions and contracts are critical for businesses to remain agile without becoming over-committed. With data breaches and Europe’s GDPR enactment getting the bulk of attention in the media, security & access control around mission-critical facilities remains critically important to data center operators. Attendees are learning about next-generation access control offerings, cutting-edge smart building technologies, biometrics and role-based access control systems. These major business disruptors continue to push companies to transform and scale their data center operations, all while maintaining operational costs. It is critical to choose a trusted advisor with a proven track record to manage these ever-increasingly complex initiatives. Align’s team is prepared to help your team address any data center challenges – we have more than 30 years of experience advising, designing and deploying mission-critical facilities for enterprises around the world.